Ok OK, this one’s a bit old. OK OK I found it in my drafts, unfinished, from way back when. But hey, sweetcorn was one of my few successes this year so I’m not missing the chance to post about them, no matter how late. Back in mid-September Miss MBaF and I pootled off to the plot. 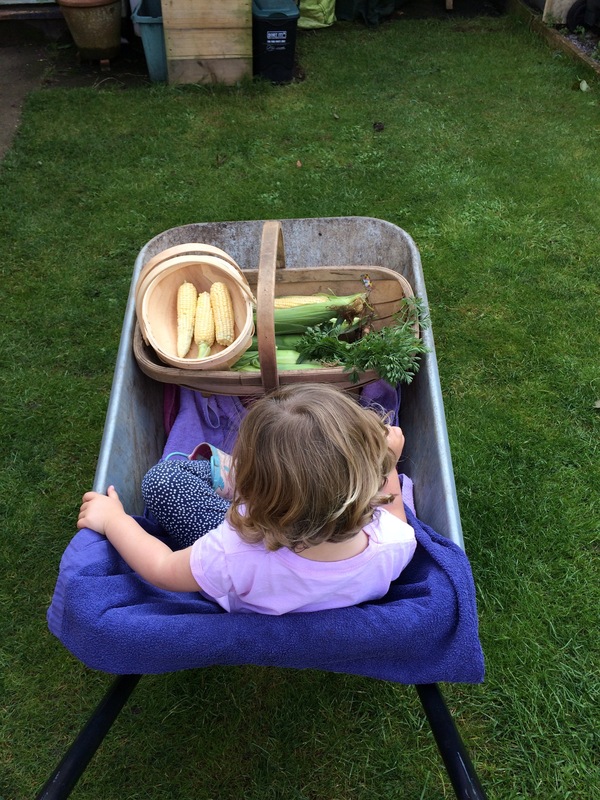 Well, I pootled, pushing her in her favourite ride, the wheelbarrow. 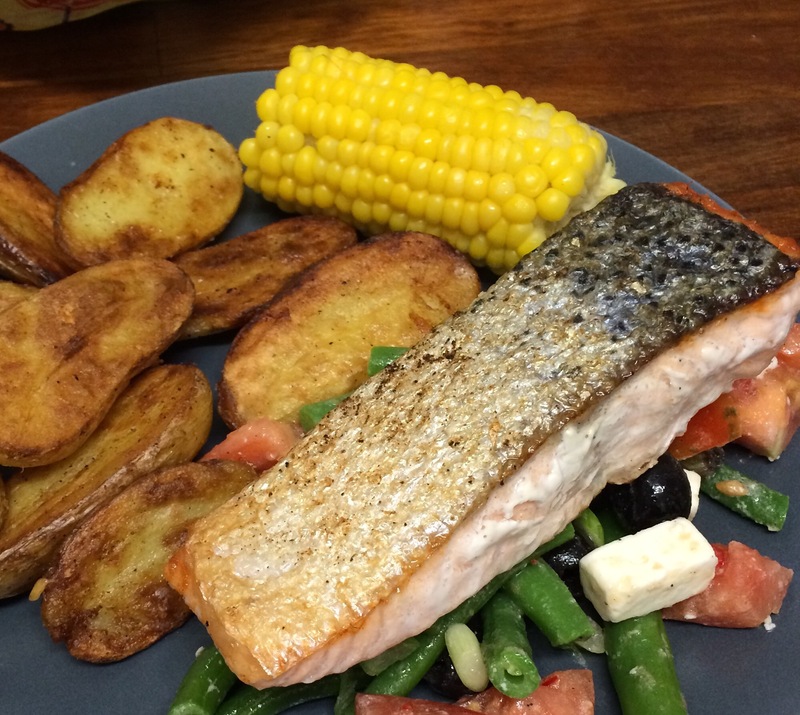 We’d already had a few sweetcorny meals, but some were poorly conceived – corn on the cob does not, I discovered, go with everything. So I decided to pick and freeze the rest of the harvest, quickly, before it got overripe. 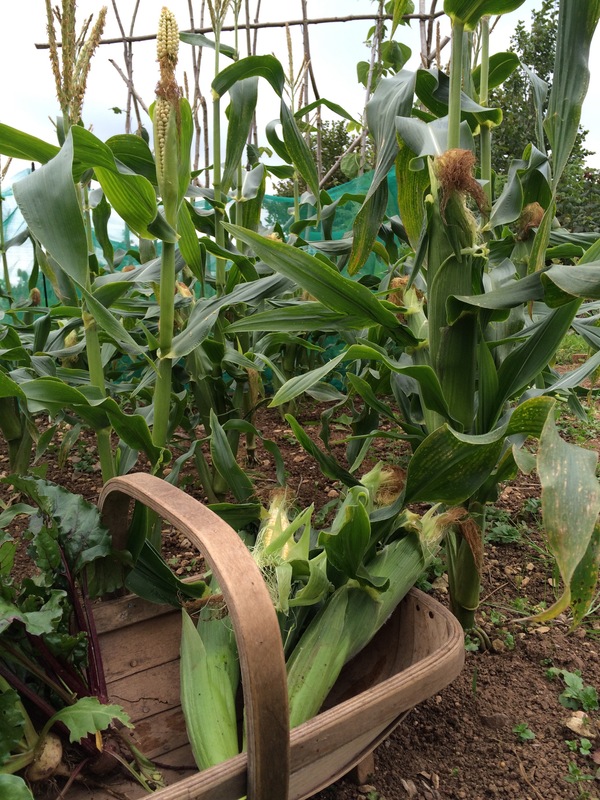 Almost all of the 20 plants in my sweetcorn square had at least one usable cob (though some we’d eaten already). The second cobs on lots of plants were a bit skinny, and when I peeled back the husk it was clear they weren’t worth bothering with. But it was a good haul and, chuffed with our efforts, back we strolled…and rolled. I halved the cobs, blanched them in boiling water for a couple of minutes, plunged them into iced water to stop cooking, and drained them thoroughly, before freezing. Boiled straight from frozen for 5-6 minutes they’re a sweet taste of the summer in autumn. 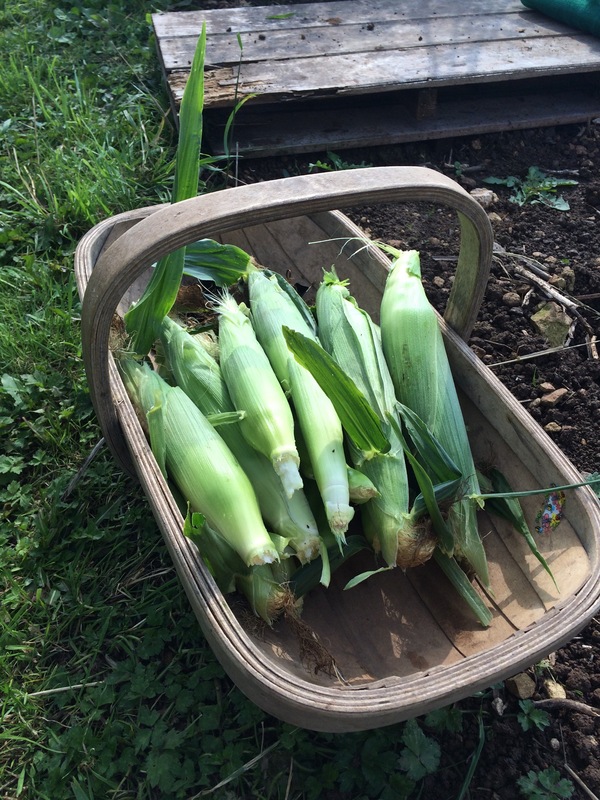 It’s true that there’s nothing like sweetcorn cooked fresh from picking, but these are the next best thing. It’s like exercise, this blogging lark. When you’re doing it routinely, regularly, when you’re ‘in the swing’ of it, it’s easy and pleasurable. But as soon as you stop for a week or two it ain’t half difficult to get going again. As with exercise, I’m also finding it harder to motivate myself when the weather’s dreary. There are fewer opportunities to get out in the earth and get inspired. But, here I am, back and writing – at last. And my absence was not caused entirely by laziness or apathy. 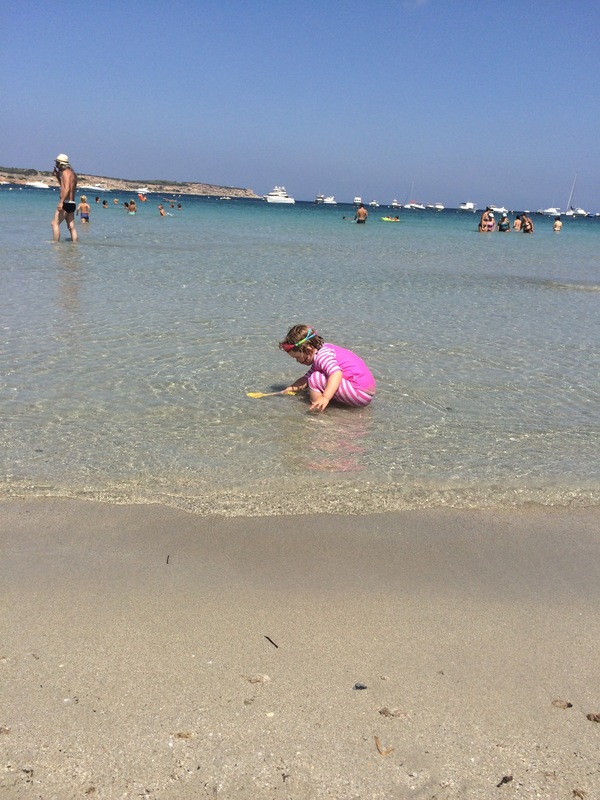 We holidayed (in Malta – at last, a shot of hot sunshine!) for 10 days and there’ve been new routines to get into on our return as Miss MBaF began a new preschool. But there are no more excuses now, so I thought I’d start with a long-awaited (I mean, two or three years) Pick of the Week Month, which is…..drum roll please…..SWEETCORN!!! Sounds the horns! Fly the flags! Roll out the barrel! Swing the cats! It finally happened, I finally managed to grow numerous, healthy, sweetcorn plants! They managed to pollinate, they stood up to the gales (with help) and cold weather and they survived abandonment at the moment they were ripening! And on the day after we returned from holiday I picked the first perfectly ripe, tightly packed, wonderfully sweet, delicious cobs of corn. I’m rather pleased, can you tell? This is the description I saw a facebook friend (and fellow allotmenteer) use to describe where we live. It’s entirely appropriate, and the plot is certainly feeling the effects this year. As I’ve mentioned several times (yawn), this year is last chance saloon for sweetcorn. I’m pretending to be ruthless, to scare them into production, but I’m giving them every chance of success. First I bought seedlings, rather than sowing myself, then I potted on and hardened off – waiting for the worst of cold to pass before planting up at the plot. Then I ordered some mesh to protect them from the worst of the winds. So here are the little darlings in their special shelter. They’re looking really good so far, so fingers crossed for some cobs! 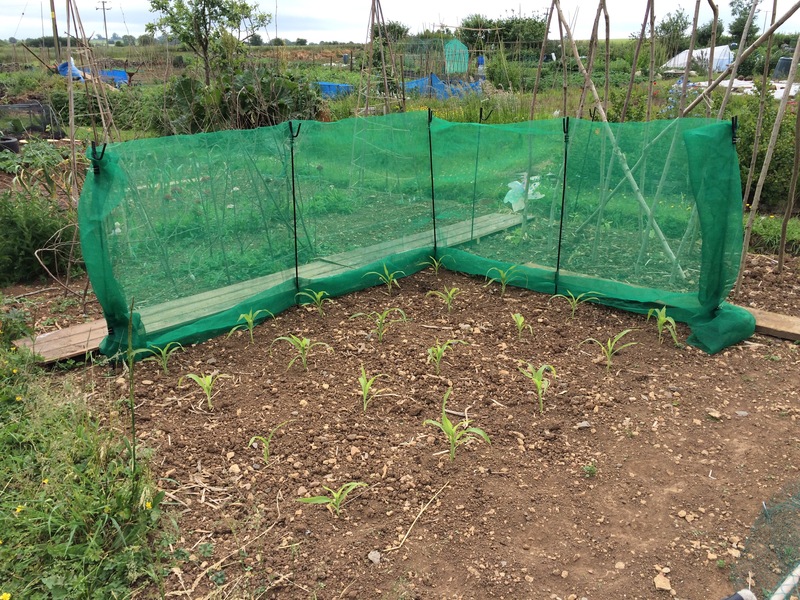 The climbing french beans next to the sweetcorn have been looking very sad and not putting on much growth, so I’ve now swaddled them with some mesh too – and hopefully they’ll start going for it. 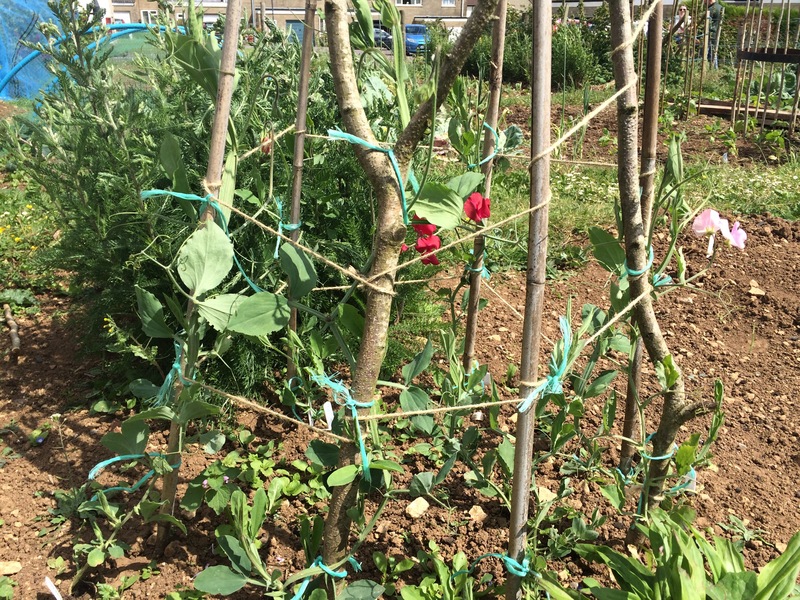 The difference the wind makes is shown pretty clearly by my two wigwams of sweetpeas. Top picture is furthest from the windy side – growing strongly and already producing some flowers. Bottom shot is the wigwam that was – admittedly – planted a bit later, but they’ve been properly battered and are feeling the effects. I’m considering protecting these little fellas with my never-ending supply of mesh – but do I really want a bright green fence all around the plot? Returning home today from a short-but-sweet family break, I discovered the postie had left an exciting parcel. My sweetcorn (Swift) plugs have arrived! Could’ve done with a reminder email from Suttons (maybe it’s in my spam?) – imagine if we’d been away for a week! But no harm done, they look plenty verdant still. This is truly the very last chance I’m giving sweetcorn on the allotment. For the last two years I’ve been thwarted by poor germination, and poor performance from the remaining few plants. So I’ve resorted to buying seedlings instead. They’re a short variety, which I thought might cope better with our exposed location, and I’ve planned the plot to shield them with climbing beans. First I’ll pot them up, so I can wait a week or so for it to get a touch warmer before planting out. But mark my words sweetcorn, this is absolutely your last chance. I really wanted roast parsnip with our dinner tonight, but I completely wimped out of the required allotment trip. The freezing winds, sleet and mud just weren’t for me today. But weather like this is spot-on for one important task. Planning. Cabbage – under-rated but such a useful veg, cooked and raw, and liked by all our family. Also, our soil seems to grow brassicas extremely well. I guess it must be on the alkaline side (they like that), though I haven’t checked (maybe I’ll get around to that this year). Planning to grow a row each of autumn and winter varieties. Some kind of hardy leaf – undecided whether to grow spinach or some kind of kale. I think spinach is a bit more adaptable as an ingredient, so that might swing it. Early potatoes – I haven’t decided on the variety yet but I’m after something with a the distinctive sweet flavour of a proper new potato. I grew Charlotte last year and they were tricky to cook fresh out the ground (outer disintegrated when the middle was tender) and didn’t have the flavour I’m looking for. I think older varieties like pentland javelin or sharps express might suit me better. I’m not bothering with maincrop this year. They take up a lot of space and I’m unconvinced I could tell the difference between homegrown and shop-bought once roasted or baked. Carrots – I’ve been tentative about committing to carrots! But with some half-hearted effort last year I got promising results, so this year I’m planning to take the plunge with a few rows sown successionally for a long harvest. I think they could be a winner with Miss MBaF too. Beetroot – roasted beetroot was a recent discovery that I’m keen to enjoy much more! Lettuce – I’m really quite crap at growing lettuce. I’ll use some new varieties this year and try to motivate myself to cut and wash it. 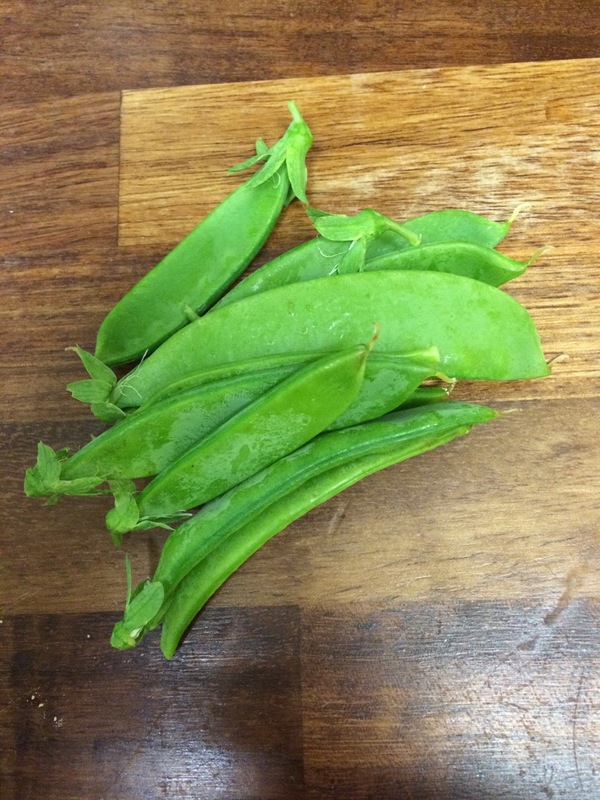 Peas – love them fresh for the pod. Gotta be grown. One row got hammered by pea weavil last year (no, I’d never heard of it before either), but now I know what to look for and I have a spray to treat the young plants with if necessary. 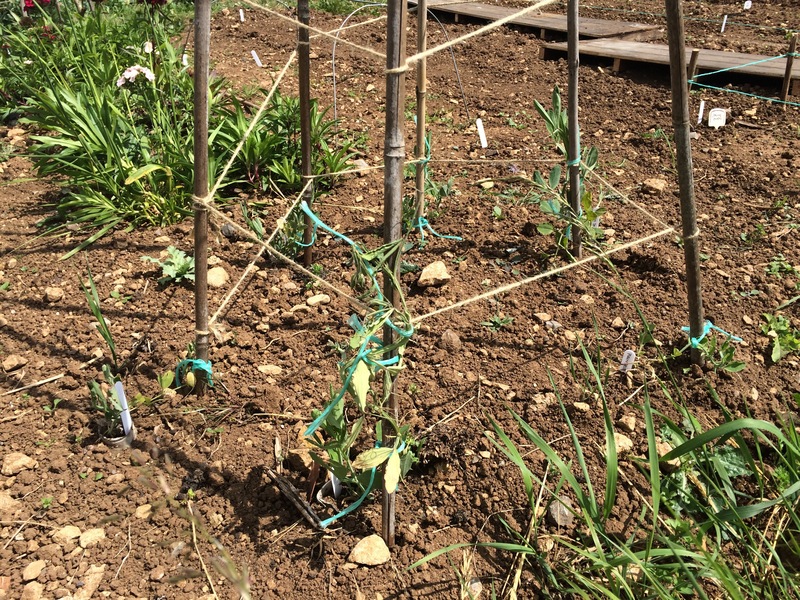 French beans – we’re not keen on runners so I’m going to stick to frenchies this year. And I’m going to grow them on a straight row of supports instead of a wigwam, as the tops got too tangled to pick like that. 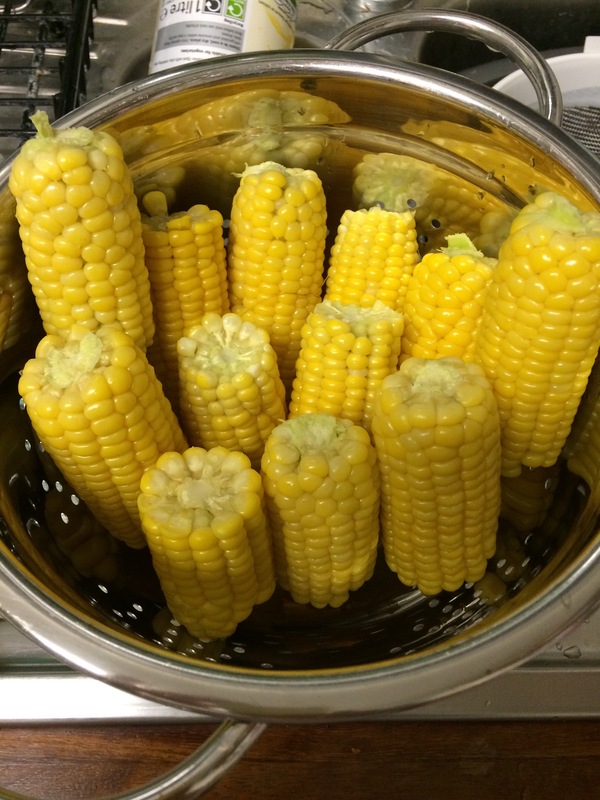 Sweetcorn – one last try. Last year was a disaster: terrible germination, no crop. I haven’t worked out how to improve the germination yet, will have to read up…or just buy young plants. The plot is very exposed, which really doesn’t help, but I’m planning to shelter them behind the beans (sorry beans!). 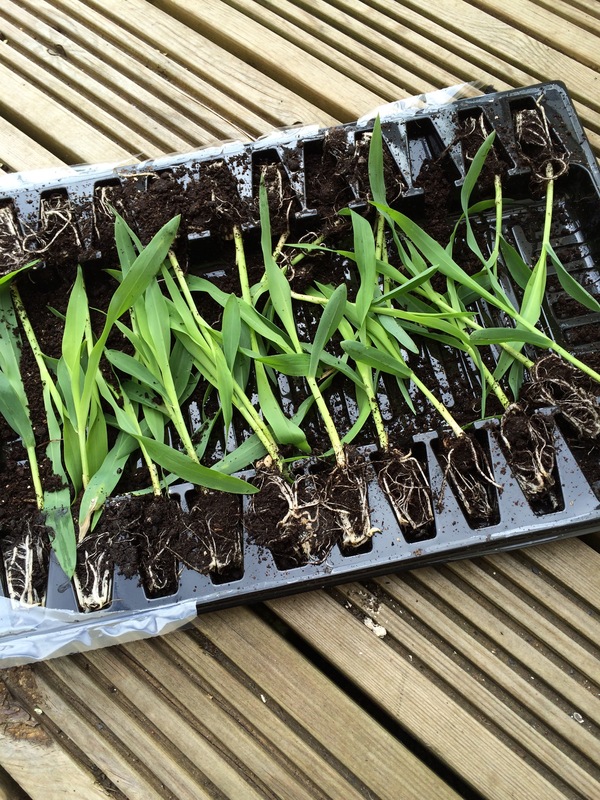 Flowers – I’ve started a little plot for cut flowers, they’ll need some shelter too I’m sure. Fruit – but I’ve blogged about that plenty. So that’s it. At some point before too long I’ll have to work out what happens after, when the first crops are lifted and I’m thinking ‘what next’? But for now, I need to start seed shopping.